How often do you floss? And be honest, because anthropology and biology major Grace Roberts can see the truth! The sophomore Bodenhamer Fellow is working with Dr. Peter Ungar to research patterns of tooth wear, with hopes to ultimately help dentists better identify and combat this wear in their patients. 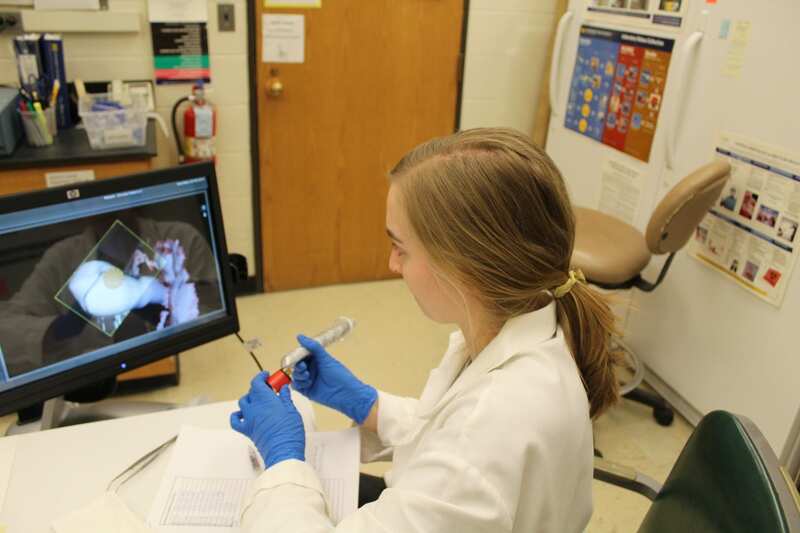 Grace recently took a trip to Michigan (funded by an Honors College Research Travel Grant) to scan more than 240 human teeth — at lightning speed! Here Grace documents the details of her trip and data collection, and offers some handy tips for the eager research traveler. I am several months into studying the progression of age-related tooth wear in human premolars. This is an issue inherently tied to advancements in modern dentistry that are allowing more people to keep their own teeth for most of their lives. Different diets and habits can accelerate the speed of this natural wear process, but the structural changes that occur can greatly impact a tooth’s function, and dentists are still learning how to best treat this problem in patients. Dr. Ungar and I have been collaborating with two DDS-PhDs at Indiana University and the University of Michigan, and the latter was my recent destination for data collection. I previously traveled to Ann Arbor back in July 2018 to use a clinical dental scanner in the U of M School of Dentistry’s facilities. The collection of teeth I used was mailed in from Indiana, and I started out with a pilot sample of forty teeth. I relied on these initial scans in order to develop my analysis method, apply for funding for my project, and develop a plan for expanding my sample to a much larger number of specimens. This time around I scanned over 240 teeth pulled from the same collection from Indiana University. This expanded sample should paint a much more accurate picture of potential patterns in tooth wear over the wide age range of the selected specimens. My pilot data has shown interesting trends, namely a wide amount of variation in tooth structures within the same narrow age categories. The analysis incorporated in my project has only been applied to other mammalian species in previous studies, and these results indicate relatively stable, predictable changes in tooth structures over time. Developing a method with my pilot study was inevitably a challenge; the softwares I attempted to use are not normally compatible with each other or readily used together. But the final product of my efforts since July is a single, concise, cohesive protocol that’s a new standard for the Ungar laboratory. Most significantly, my travel to Michigan has enabled the incorporation of a scanner that is readily available to dentists, which furthers my project’s goal of developing better strategies for dentists to assess and manage tooth wear. My recent trip to Michigan passed just as quickly as the last one, which required a more structured timetable and much faster pace for the scans (to finish six times as many in the same amount of time). Dr. Gonzalez, my collaborating mentor from Michigan, was instrumental in helping everything run smoothly with the scanner, and he helped me divide and conquer some of the work involved. Overall, the trip was a great success, and I finished my data collection perfectly on schedule. I’m extremely grateful for the support of all three of my mentors, and their perspectives have each been valuable in aiding the progression of this research. I have a great deal of analysis to handle in months ahead, but I look forward to working towards a publication and achieving a better understanding of the more complete results this expanded sample will produce. Despite this being what felt like a whirlwind trip, I undoubtedly learned more than a few lessons along the way. Always (always) carve out more time than you think you will need if you’re collecting data. After several hours, scanning teeth is more exhausting than it may seem, so it’s better to go at a safe pace than risk compromising the quality of data. Consider the delays that will more than likely be involved when traveling through Detroit or Chicago in mid-February. You may not make it to class Monday morning like you planned. If you’re not sure about how to interpret your results, seek a second opinion, or a third. Every mentor has an incredibly valuable opinion to contribute, and the more of these you can accumulate to work through a challenging problem the better. Try to view every problem you run into as a learning experience. My research experience has been full of disheartening obstacles, but working through these and learning from them has been the most rewarding aspect.